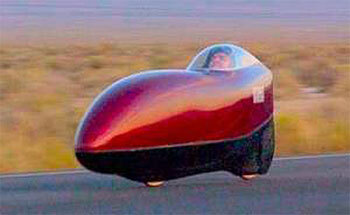 A streamlined recumbent bicycle, Varna Diablo has achieved 82.33 miles per hour under human power alone. At the first IHPSC in1975, IHPVA founder Chet Kyle’s Teledyne Titan was clocked at a speed of 44.69 mph. In 1986, Gardner Martin’s Gold Rush (now in the Smithsonian) ridden by “Fast Freddy” Markham won the DuPont prize at a record 65.484 mph. In 1992, Cheetah, ridden by Chris Huber, broke 68 mph. In 2008, Sam Whittingham became the World Champion and won the $25,000 .Decimach prize with a speed of 82.33 mph.